Neapolis University in Cyprus proudly announces the official commencement of its collaboration agreement with Middlesex University. The agreement was signed between Mr. Michael Leptos, President of Neapolis University Governing Council, and Ms. Anna Kyprianou, Pro Vice-Chancellor and Executive Dean of Middlesex University. 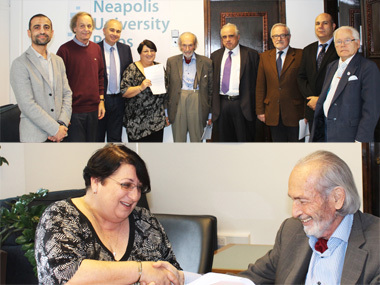 The collaboration will enable the award of two degrees for validated programmes delivered by Neapolis University Pafos. This means that on the successful completion of such a programme, fully realized in Cyprus, students will receive two degrees, one by Neapolis University and one by Middlesex University.